For many older individuals approaching the end of life, faith and religion become more important, providing them with strength and purpose. In a series of interviews with residents living in long-term care, the vital role of belief becomes apparent as these elderly deal with the loss of their physical strength and functional capabilities as well as the loss of friends and relations who are no longer alive. For them, the world has changed often leaving them only the support of religion. They look forward to coming together at services, singing songs they have always known, and being comforted by familiar passages in the bible. 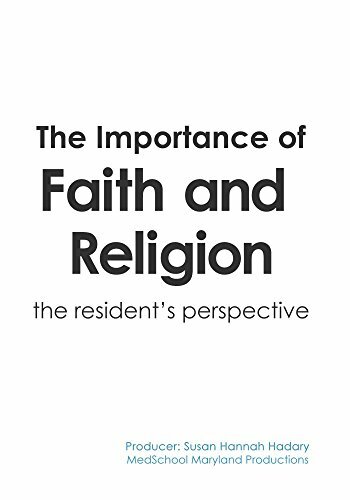 While not all residents wish to participate in religious activities, nursing staff who see this DVD will realize the importance of making sure that those who receive comfort from their faith and religion are given every opportunity to participate in weekly services, holidays and conversations with their faith leaders. This DVD is appropriate for all staff working in long term care, assisted living and for students training to work with the elderly. When sold by Amazon.com, this product is manufactured on demand using DVD-R recordable media. Amazon.com's standard return policy will apply.